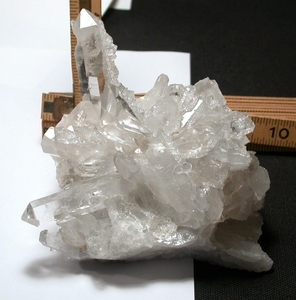 Massy cluster of blazing-clear Arkansas rock crystals showered with glitter and barnacle crystals sports a penetrated optically clear complete twin of 1x 2-1/8", a 1x 3" nested tabular crystal, and a 1/2x 2-1/4" conjoined twin next to a 1-1/4" growth crater. Even conchoidal and regrowth areas show rainbows, and the drusy/chert-included plate bottom glitters. Two missing faces and one small bruise do not detract from gorgeous. Closed Clear Creek Mine, Hogjaw area, Montgomery County . Overall size: 2-1/2x 4-3/4x 5".